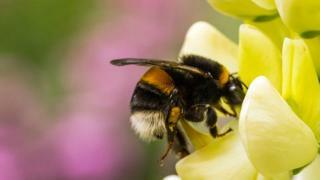 The alternatives had been sought because of the evidence linking neonicotinoids to declines in bee populations - leading to the bans and restrictions on their use. "Our results show that sulfoxaflor can have a negative impact on the reproductive output of bumblebee colonies under certain conditions," said study researcher Harry Siviter of Royal Holloway, University of London. What are the new insecticides? The new insecticides, based on a chemical known as sulfoximine, have a different chemistry from neonicotinoids and have been seen as a likely successor. The researchers are calling for regulatory bodies to look at non-lethal effects on bees before issuing a license for new products. "Our study highlights that stressors that do not directly kill bees can still have damaging effects further down the line, because the health of the colony depends on the health of its workforce," said Dr Ellouise Leadbeater of Royal Holloway, University of London. Scientific studies have linked their use to the decline of honeybees, wild bees and other pollinators. The campaign group Friends of the Earth said the upcoming ban on neonicotinoids is great news for bees - but the government must ensure that alternative pesticides don't harm pollinators too. "This study shows that replacing one harmful pesticide with another is not the solution to protecting our crops," said pesticides campaigner, Sandra Bell. The NFU, which represents British farmers, said farmers need "an effective crop protection toolbox available to combat pests and allow them to produce food for the public". "All the products farmers do use have to go through a stringent approval process before they can be registered for use to ensure they pose no unacceptable risk to people or the environment, and are applied in a highly controlled, highly regulated way."